If you’ve been around here for a while you’ve most likely seen the pop up window inviting you to sign up to receive monthly planners. I failed to keep up with it last year and aside from the pop up, I didn’t really talk about what I’m giving you, for free, every month. One of my big goals for this year was to not only keep up with it but to make it better and more useful. I don’t have children so I can’t claim to be a busy mom but I do run a small stationery company that demands a good chunk of my time. I have three dogs, a home and a husband that works very long hours outside the home that also travels a lot. Even though I’m not caring for children, my life feels hectic and for years, I struggled to keep up with my house, cook a decent dinner and not feel like I’m drowning in my work. One of the things I did to help make my life feel more organized and lower my stress was meal planning. It was one of the easiest habits I have ever formed in my adult life. Since starting, I have never looked back. I am human, and there have been weeks where I didn’t sit down to plan, but I always regret not taking the time. Meal planning has not only making my weekly meals much easier, it has also streamlined my grocery shopping by making my trips more efficient. If you want to see my exact process for meal planning, you can check that out here. In addition to meal planning, I have also found that in both my work and my personal life, setting monthly, weekly and daily goals help me stay focussed and actually get things done. Just like when I forget to meal plan, there are days, weeks and even months that I don’t do the proper planning but I always come back to it because it does make a difference in my life and stress. Because planning has made such a difference in my life, I knew that no matter where you are in life, it will help you too. That’s where the planner pack comes in. Every month, I send my subscribers a meal planner that they can print out and use for each week in the month. 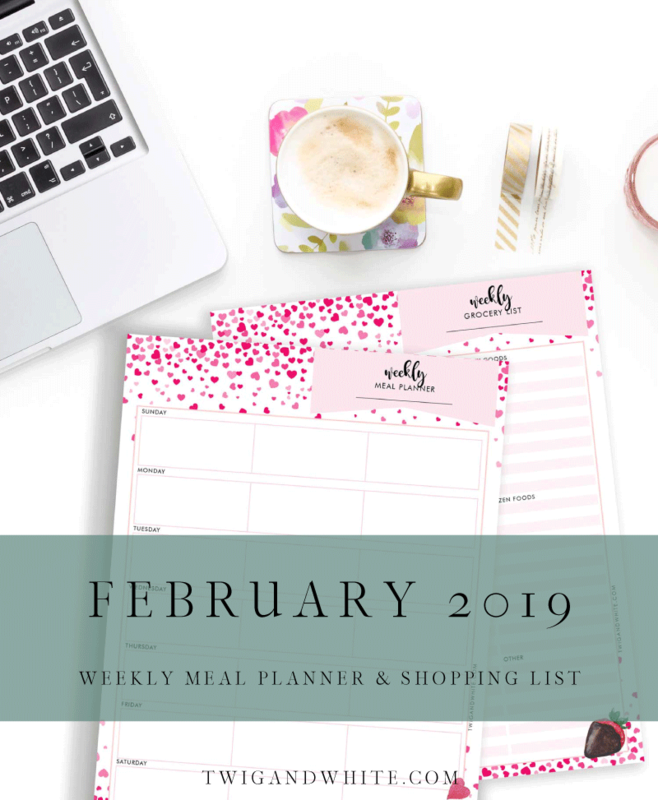 This year I have also added in a grocery list template that you can fill out as you are making your weekly meal plans. 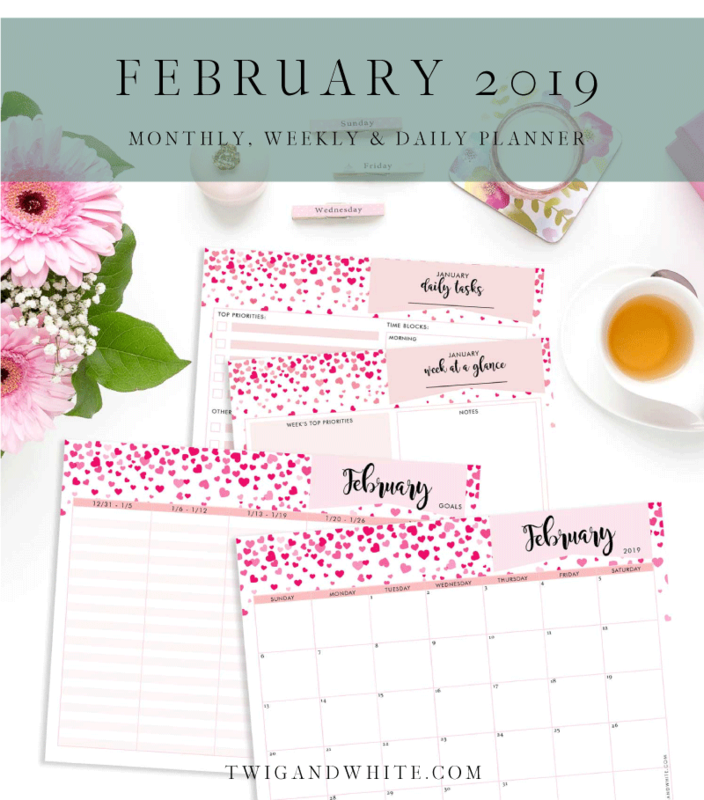 In addition, I also send a 4-page life / work planner that includes a monthly calendar, and monthly, weekly and daily planner / goal setting / time blocking form. Each month the planner design is different. I love pretty paper and know that when something is pretty, I’m more likely to use it so I take the time to create something that I enjoy using too. And believe it or not, I actually use the exact planner that I send you every month. Taking just 30 minutes each week to do all my planning is all it takes to make a huge difference in my weekly life. That’s it. Tomorrow the February planner pack goes out. If this sounds like something that could help make a difference in your life, sign up using the form below. As a new subscriber, you’ll also receive some additional goodies just as an extra thank you.